Built in 1805, Bowcliffe Hall is set in twenty eight acres of spectacular grounds, superbly located just 5 minutes drive from the A1M, four miles South of Wetherby and within easy reach of Leeds. Fully serviced offices range from 95 sq ft to 2,288 sq ft and are located within Grade II listed Bowcliffe Hall itself, or in the West Wing. All serviced offices are business ready and have the advantage of natural daylight, many with views across the Estate. We also offer unserviced offices. Working from a serviced office on the Bowcliffe Hall Estate is a lifestyle choice. We offer a unique, uplifting work environment and seek to support and assist you in any way we can to make the day to day running of your business and the happiness of your team, the best it can be. Join our running club or weekly Pilates sessions, have your car valeted, dry cleaning collected, or just enjoy walking around the 28 acres of landscaped gardens. 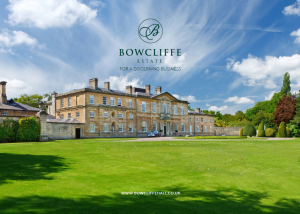 Anyone taking a serviced office is entitled to free membership of the Bowcliffe Drivers’ Club, a private members’ club located on the ground floor of the Hall, with décor inspired by the glamorous 1920s and the Golden Age of Motoring. Outstanding meeting facilities including the award winning inspirational Blackburn Wing are also available. With one eye on sustainability, the Estate is almost entirely heated using a ground floor pump heating system, the grounds maintained using water from our rainwater harvester and low energy lighting systems used wherever possible. With an on site IT advisory service, free car parking, bicycle storage, electric car charging points and many offices with shower and kitchen facilities, we strive to cater for your every need.